Alongside the video-centric GH5, Panasonic has used this year’s CES to add two more junior models to the Lumix portfolio. 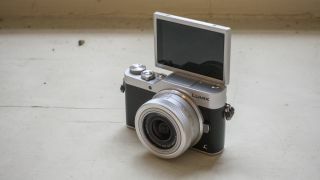 Billed as the “ultimate high-performance compact mirrorless camera”, the Lumix GX850 (known as the GX800 outside the US) arrives with a 180-degree tilting touchscreen, and is unashamedly targeted towards those capturing selfies. Indeed, alongside 4K video and 4K Photo options, it's the first Lumix model to offer a new 4K Selfie option. Another focus for the model is panoramic shooting, and Panasonic has even made it possible to capture these when the screen is flipped up for selfies. There's also a new Background Control mode, which lets you decided whether you want to capture sharp or defocused backgrounds without having to manually change the aperture. The model misses out on the latest-generation 20.3MP Micro Four Thirds sensor seen in the GH5 and GX8, although the 16MP alternative offered in its place is understandable when you consider the model’s target audience. The camera does at least omit an optical low-pass filter to enable the capture of fine details, and so it may well appeal to those looking for a second body for landscapes or macro work. Wi-Fi is on board, as are Focus Stacking and Post Focus options, together with a myriad of Creative Control and Photo Style options. There’s also a new Venus processing engine, as well as Depth From Defocus (DFD) AF technology that promises to bring subjects into focus in as little as 0.07 sec. The Lumix FZ80 (FZ82 if you're outside the US), meanwhile, is a budget superzoom bridge compact with the significance of a 60x optical zoom. This starts from a usefully wide focal length equivalent to 20mm in traditional 35mm terms, and culminates in a dizzying 1200mm setting. You can use this in conjunction with an Intelligent Zoom option, which doubles the effective maximum focal length to 2400mm, and you can increase this even further with the LT55 Tele Conversion Lens, a combination that’s claimed to be powerful enough to capture the cratered surface of the moon. Thankfully, the lens is partnered with a Power O.I.S. system that’s effective across both stills and video shooting, with images and videos recorded to an 18.1MP High Sensitivity MOS sensor. Like the GX850 / GX800, the FZ80 / FZ82 has the option of recording videos to the UHD 4K (3840 x 2160 pixels) standard, together with high-speed video options and the same impressive 4K Live Cropping mode seen on many other Lumix models. This allows the user to determine zoom and panning movements in advance of recording videos, thus removing the need for any manual adjustments while recording. The FZ80’s autofocus system follows many other Lumix models in featuring Depth From Defocus (DFD) technology, which here promises focusing speeds of around 0.09 sec. You can also use the camera’s 1.04 million-dot touchscreen to set focus with your finger, while above this sits a 0.2in EVF with a respectable 1.17 million-dot resolution. The model is rounded off with a scattering of useful extras, from built-in Wi-Fi and timelapse shooting to a macro mode that focuses down to 1cm from the subject. Panasonic has also introduced a new Leica DG Vario-Elmarit 12-60mm f/2.8-4.0 lens, which serves at one of the kit options with the new GH5. It supports the latest Dual IS Mark II technology and has been crafted with a dust and splash-proof design, and is said to carry on working without issue in temperatures as low as -10 degrees celsius. This is the first lens in the new Leica DG Vario Elmarit f/2.8-4.0 series that has been released, the others being 8-18mm and 50-200mm optics whose development was announced at last year’s Photokina show. Furthermore, the company has also announced plans to refresh four existing optics with more modern versions. These lenses, namely the Lumix G Vario 12-35mm f/2.8 II Asph. Power O.I.S., Lumix G Vario 35-100mm f/2.8 II Power O.I.S., Lumix G Vario 45-200mm f/4.0-5.6 II Power O.I.S. and the Lumix G Vario 100-300mm f/4.0-5.6 II Power O.I.S. support the both Power O.I.S. and Dual I.S. technologies, and the latter two have also been primed with dust and splash-proof designs. The GX850 / GX800 will arrive in March, in Black, Silver, Tan and Orange versions, priced at a penny under £500 (US pricing to be confirmed). The FZ80 / FZ82, meanwhile, will be available at the same time, with an RRP of $399 / £329.99. Pricing of the lenses is yet to be disclosed.